Linux Containers provide a simple and efficient way to run Linux guest machines by sharing the kernel with their host. And Docker makes it easy to tame these Linux containers, while providing DevOps a workflow to manage the containers' life cycle and collaborative functionality. 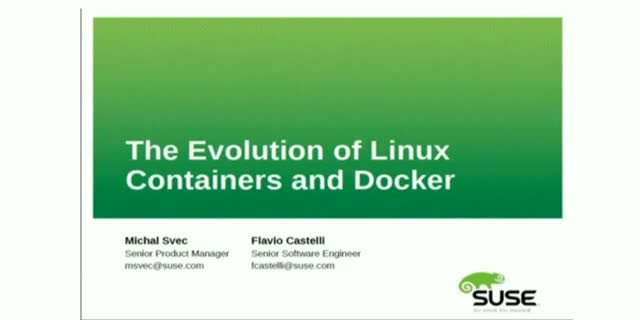 SUSE Linux Enterprise Server 12 evolves Linux Container management and introduces Docker. This session will outline the advantages of using Linux Containers and Docker as part of SUSE Linux Enterprise 12. Upgrading a huge software stack is always a big problem in a production environment with many services relying on the availability of the software stack. This problem can often be experienced while upgrading SUSE OpenStack Cloud in production environments. To minimize the downtime, upgrading from SUSE OpenStack Cloud 6 to SUSE OpenStack Cloud 7 and future releases will be made non-disruptive for the important services. But every Cloud deployment and use case is different, and this implies that every upgrade will be a little different from others. This talk will give an overview of the recommended preparations and requirements to make the upgrade as smooth as possible. Beside this, we will also show the different ways that an Administrator can upgrade the Cloud. A recording from SUSECON 16. Join us as we show you the best of SUSECON 2016. This talk will cover CephFS, review its architecture, use cases, and explore some of the impressive features it has to offer. Join Thomas Biege as he covers how SUSE makes its products more secure, why SUSE uses "backports", what you need to know about the "SUSE bug bounty program" where you can find security information on SUSE products and other important security information. If you're a system administrator responsible for a data center that is not fully automated, you have many individual workloads (called "pets") that you need to handle. Machinery is a systems management toolkit for Linux. It supports configuration discovery, system validation, and service migration. We will show how this tool can help you as a system administrator with your daily tasks for both "pets" and "cattle" and like to discuss future plans. Every cloud or cluster needs to be administered and xCAT is the open source solution to help you manage HPC clusters, RenderFarms, Grids, WebFarms, online gaming infrastructure, clouds, and data centers. Join Jarrod Johnson, a high performance and scale out computing architect, to learn what makes xCAT different from other management open source projects and how you can use it in the enterprise. openATTIC development is sponsored by it-novum. In addition to managing "traditional" storage, the openATTIC project is currently collaborating with SUSE on adding management and monitoring functionality for the Ceph distributed storage system. By supporting both "traditional" storage and Ceph, openATTIC allows the user to scale and grow his storage infrastructure as needed, while still being able to use the same tool. In this webinar, Lenz will give an overview about openATTIC's architecture and technology, highlighting the functionality and features currently available. It will also give an insight into the ongoing and future development plans and the community resources that support the project. One of the most important capabilities for companies to have is the ability to quickly adapt. Teams, developing not only software, should be ready to follow the wind of changes in the market. Yet companies are faced with these questions: is our infrastructure ready for change? What is the cost of making needed changes? How do we adapt in a new environment? In this talk Artem with show DevOps techniques that can help companies get ready to meet these challenges. He will use real life examples like fast deployments, continuous integration/delivery/automation, and “dockerization” of applications, lean development, systems orchestration, and behavior-driven development to demonstrate how companies can quickly adapt to market changes. Did you know that nearly all product documentation at SUSE is published under an open document license, such as the GNU Free Documentation License, or Creative Commons? And did you know that we use mainly open source tools during the processes for the creation of our guides, quick starts, best practices? If you are curious to hear more about these tools and processes, just join the talk, and discover how you can influence quality and output of the SUSE documentation work. module, and librbd library. This talk will offer an introduction to Ceph RBD, and focus on how such devices can be utilized by non-Linux platforms via the iSCSI protocol. The talk will conclude with a demonstration video showing a VMware ESXi cluster connected to redundant iSCSI gateways. Join us as Patrick Quaiiroli discusses open source concepts, licensing, and the influence of the collaborating model of the golden age of technology. There are numerous methods available when upgrading to SUSE Linux Enterprise 12 Service Pack 1. This talk will cover some of the tools you can use in both manual and semi-automated upgrades, like yast, zypper, SUSEConnect, snapper and others, that you will want to know to perform a successful upgrade. But just in case something goes wrong, this session will also focus on how to use snapper to rollback a failed SUSE Linux Enterprise 12 Service Pack 1 upgrade. A review of the setup steps and tools required for running an instance of SUSE Linux Enterprise Server 12 in Amazon Elastic Compute Cloud (EC2), Microsoft Azure, and Google Compute Engine. openQA is a new technology, first developed by the openSUSE project and now also used by SUSE for automatic software testing of the SUSE Linux Enterprise Products. This session will give an introduction to openQA's capabilities, discuss the benefits of its use in modern software development, and suggest ideas to attendees as how it could be used for testing their software, operating systems, or virtual machine images. When a hardware platform is certified, the hardware and the Linux OS are validated for compatibility in key areas where the hardware and OS interact or “touch” one another. Some of these touch area’s include: system firmware, boot, storage, network, crash capture, power management and new processor features. In this presentation we will dive into some of these areas, discuss why certification is crucial today and is actually becoming more critical every year. In this session Kai Dupke will discuss the challenges of running services on an enterprise level and how SUSE answers the need for high availability. You'll learn about SUSE's high availability stack plus the features and benefits of using the SUSE Linux Enterprise High Availability Extension. The Open Build Server is a cross-distro, multi-architecture platform for building packages from source code into native package formats for a wide number of Linux Distributions. From a single source tarball or source repository like git, you can create rpm and deb packages for all major Linux distributions on all supported hardware architectures. This presentation will first outline the major features and explain how various distros are supported. The latter part of the presentation will show a live demo of creating a package and showing the various build steps and QA checks integrated into the system. The latter part of the demo will show the gpg signing, publishing and automatic repository creation - allowing end users to consume packages using the default package management tools for their distro. The presenter has been using OBS since 2006. This session explains the benefits of rollback and how it can be used. You’ll receive a short introduction about btrfs and Copy-on-Write and then you’ll learn how system rollbacks work on SUSE Linux Enterprise Server 12. You’ll understand how to select an old snapshot, what can you do with it and how you can make it the default for system recovery. Additionally, you’ll see what the recommended partition layout should look like, what should be included in the snapshot and the pitfalls to avoid. Business critical services are increasingly being hosted on Linux and need to be protected against various threats. The proven and mature Open Source High-Availability Clustering Suite automates recovery from node and software faults, secures the data and eases administrative tasks. This presentation will outline key concepts, use cases and features of the software stack. Technology, Trends, and Advances in Linux & Open Source. Join the SUSE Open Source Talks webinar series to discuss topics and advances in Linux and open source technologies. Hear from leading industry experts as they share their knowledge and insights on some of the hottest technologies and trends in the industry.